So, this Pumpkin Cookie Dough Dip happened…and it’s going to happen again…and then throughout the Fall…and maybe a little or all of winter also. I. JUST. CAN’T. GET. ENOUGH. 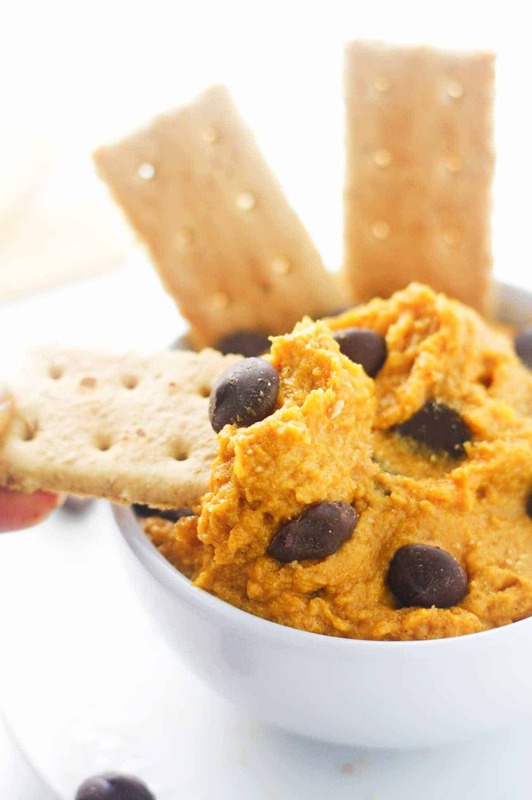 If I’m going to be completely honest right now, I know that some people like to express their fall appreciation a little more than others, but this Pumpkin Cookie Dough Dip is something that absolutely anyone and everyone can enjoy. Like…it’s actually so insanely addictive that I’m going to have to train myself to learn to share with others. Not there yet..but definitely working on it. The fact that this deliciously amazing dip is Vegan and friendly and can easily be adjusted to make it gluten free & paleo, means that you’re pretty much going to be a crowd favorite. Whip up a batch for a potluck and people will soon realize that not all heroes wear capes, my friend. In a large bowl, combine the pumpkin puree, maple syrup, whole wheat flour, vanilla, cinnamon, vegetable oil spread and PB Fit powder until the ingredients are fully incorporated. Gently fold in the chocolate chips and enjoy!